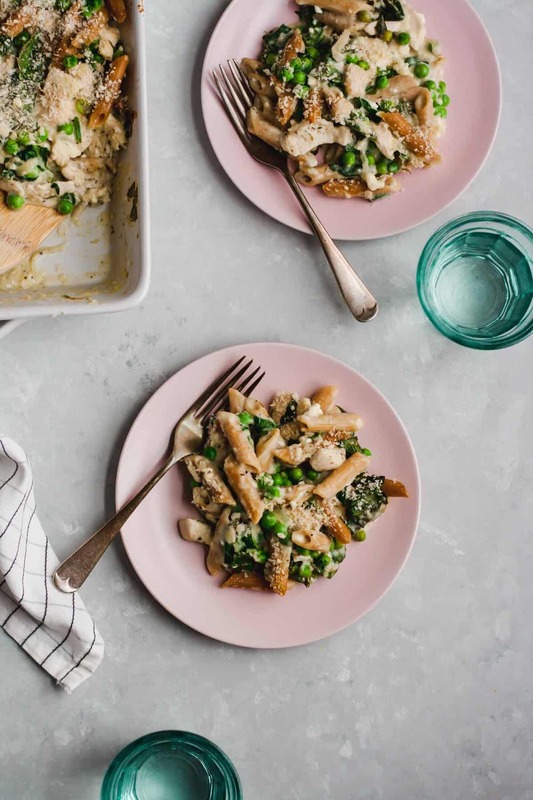 This Chicken Pasta Bake with Feta and Peas is quick and simple to prepare and makes for the perfect cosy comfort food. 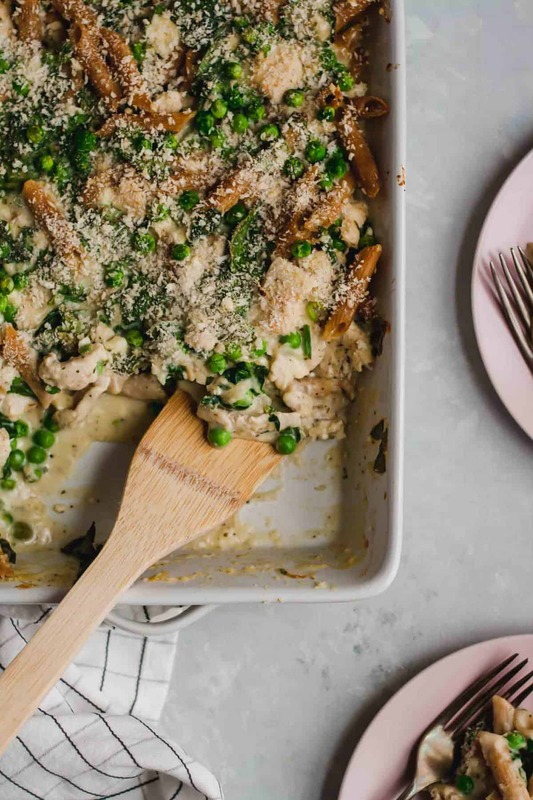 Meet the chicken pasta bake of your dreams. Oh my goodness, you guys. In all honesty, pasta isn’t really my thing. Don’t get me wrong (I can see you looking at me with squinty eyes!) I adore a good bowlful of pasta. It’s just that it can be so boring. Well at least that’s what my husband says. So in our house, if we’re going to eat pasta, it better be insanely good. And let me tell you – this is. So good! This is proper cosy wintry food. One of the best ways to eat pasta in my opinion is in pasta bake form but it can be dry. Ugh, that’s just the worst. 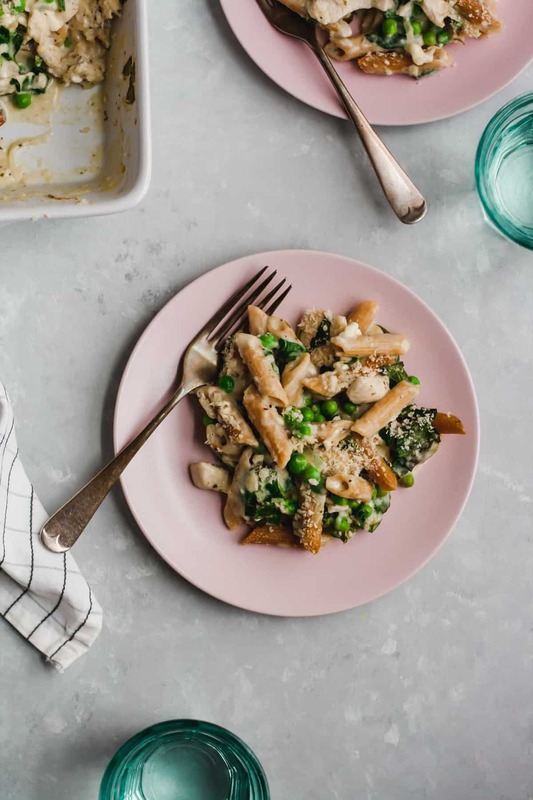 You dig into a pasta bake with such high expectations that it’s going to be the ultimate in comfort food only to bite into tough pasta with non-existent sauce. This is not that! Ha, speaking of dry though. The worst thing happened to me this week. Ok, maybe not the worst thing EVER but pretty much the worst kitchen thing to ever happen. I put a pan of quinoa on to cook, like high heat to get it to come to the boil before I turned it down and put a lid on it. I then decided I’d just sit in the lounge for a couple of minutes whilst it came to the boil and then I’d return to put the lid on shortly after. WORST DECISION EVER. I completely forgot to go back to my pan and settled in to watch some Netflix. An hour or so later, I went into the kitchen to be greeted with the worst smell ever and to find my blackened pan encrusted with equally blackened quinoa. Disaster! I feel like I’ve learnt my lesson now and I will never leave a pan unattended like that again and I’ve just about got the pan clean and my house just about doesn’t smell of smoke anymore and I’m just a little bit traumatised. I promise I can cook, ok? Do you still trust me? 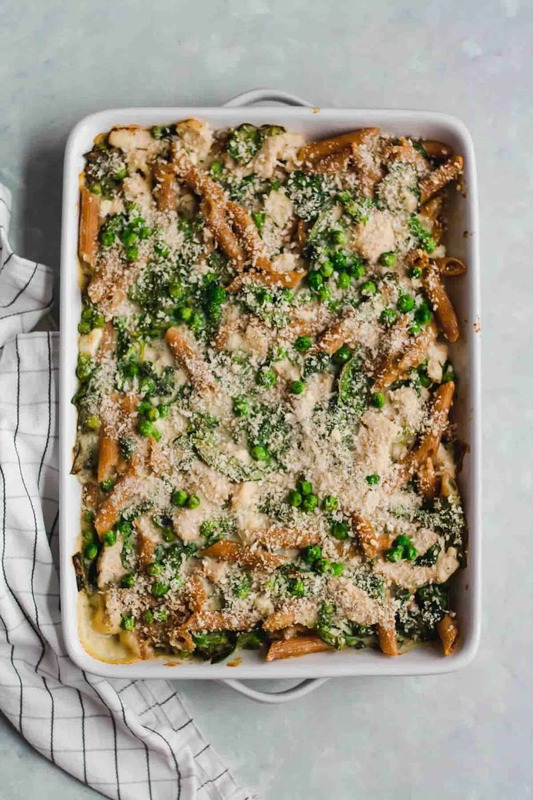 I promise that this is the most delicious chicken pasta bake that you’ll have eaten in a long time. Perhaps ever? Can I say that? Yesss. 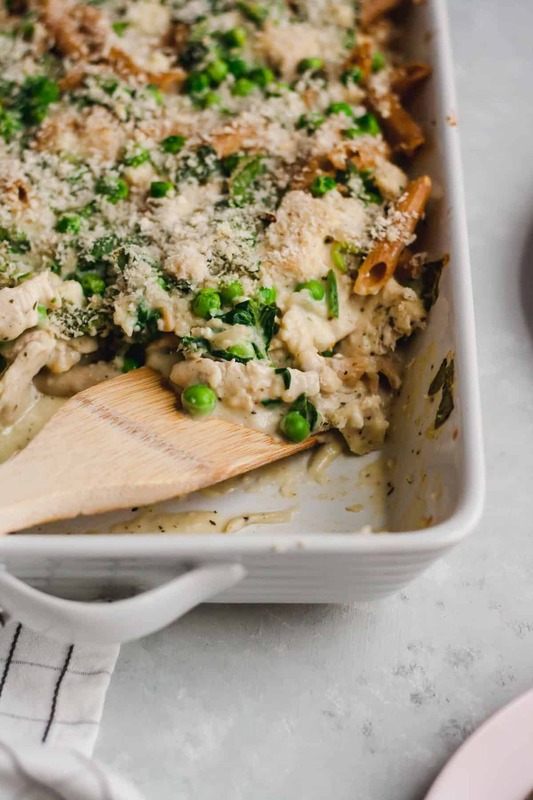 This is the best chicken pasta bake ever. How could it not be? It’s pasta and herby chicken and shallots and salty feta and just a touch of cheddar because apparently I can’t ever leave it out where cheese is involved. 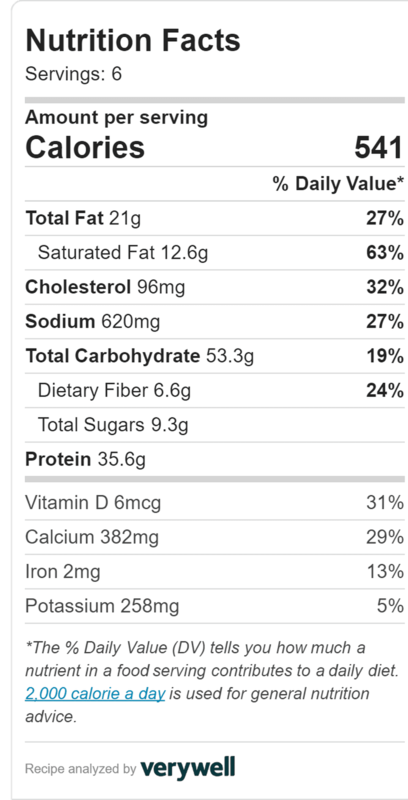 And all of that is punctuated with little pops of green pea sweetness and then spinach for extra green points. It’s so creamy and so yummy and you’ll want to eat it all week. Just be sure to watch all of your pans whilst you cook it ok? Preheat oven to 180C. Place a frying pan over medium heat and add a tablespoon of rapeseed or olive oil. Add the shallots along with a pinch of salt and cook for 2-3 minutes until soft. Add the chicken strips, the mixed herbs and a pinch of salt and pepper and cook for a few minutes until the chicken is white but not fully cooked through. Set aside. Cook the pasta in salted water for a couple of minutes less than the package instructions suggest. Melt the butter in a medium saucepan and stir in the flour and onion powder to make a roux. Cook for 2 minutes to get rid of any raw flour taste. Gradually add the milk to make a smooth sauce. Stir in the dijon mustard and cook until the sauce thickens (it won't be super thick, but will coat the back of a spoon). Crumble the feta into the sauce and grate in the cheddar. Stir to combine but bear in mind that the feta won't melt - that's ok! Season to taste but remember that the cheese is quite salty. Drain the pasta and return to the pan it cooked in (or a large bowl). Add the cooked chicken and shallots, sauce, spinach and frozen peas (no need to defrost). Stir well to combine. Season with a good grating of fresh nutmeg. Pour the pasta mixture into a large baking dish (about 9"x13"). Sprinkle the panko breadcrumbs over the top and bake for about 20-25 minutes until golden and bubbling. I get lots of comments about the plates – they’re cute aren’t they? They’re from Ikea!